Avery exciting event is being put on by the archdiocese that will happen on the eve of Pentecost this year. It’s a day for all Catholics in the archdiocese to come together and celebrate no matter your age or where you are in your faith – it’s for everyone, and we are all invited! In a world that’s experiencing deep division, Unite is an opportunity to put our differences aside and unite through what we share, instead of focusing on what divides us. You’ll be hearing quite a bit about Unite through the next 8 months, and I’m excited that our parish will be a part of it. It’s time to receive joy in a way that will refresh, energize, and inspire you. 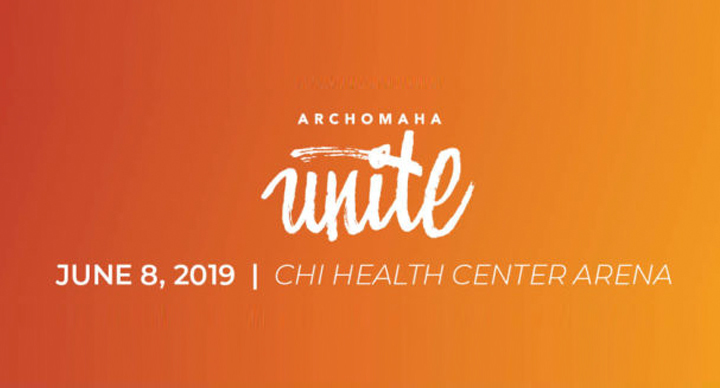 Join your brothers and sisters from across the Archdiocese of Omaha, and experience a celebration of community and faith at ArchOmaha Unite, June 8, 2019. For more information, visit unite.archomaha.org. The event, held at the CHI Health Center begins with the Great Gathering at 10:00 and the Main Event starts at 10:30. Archbishop George Lucas gathers us together for this special multimedia event featuring Q&A, stories of faith from all over the archdiocese and a few surprises. Running at the same time are Breakout Sessions for teens, juniors and wee ones (ages 4 to 6 and grades 2 – 12). The Main Event will run until 12:00 Noon. From Noon to 2:00 you will be invited to interactive exhibits, visual parish display, you can purchase food from the food carts and concessions inside the CHI Health center, leave and get lunch at a nearby restaurant or bring a picnic lunch (this must be eaten outside the CHI Center, no outside food may be brought in). There will also be games and entertainment during this time. Also from 10:30 – 3:30 there is the option of Eucharistic Adoration and the opportunity to celebrate the Sacrament of Reconciliation. At 2:15 we will have the Comedy Keynote with Jim Gaffigan. Jim is a Catholic comedian, actor and writer who will take us into the afternoon with joy and laughter. We will have Mass for Pentecost Sunday at 4:00. Catholics from all corners of ArchOmaha join together for Sunday Mass featuring the archbishop and priests, choirs and volunteers from all over the archdiocese. Note that this will be the only Saturday evening Vigil Mass in the archdiocese; no other church will be open for Masses on Saturday June 8th, this will be the only one. After Mass you are invited to purchase food for dinner if you like and then come back for Cross and Light at 7:30. This is a musical and multi-sensory video experience of Christ’s Passion, Resurrection and the coming of the Holy Spirit. You must register to attend this free event. To register go to unite.archomaha.org and press the registration tab and then follow the instructions. After you have registered you will be emailed a ticket. You must show your ticket (printed or electronically) to get in to and come and go from the CHI Health Center. If you do not have access to a computer or smart phone to get registered we can help you here at the parish, just give us a call at 402-342-4807. The community of St. Mary Magdalene Catholic Church is committed to serving the Lord, one another, and the metro area. We welcome anyone looking to learn more about God’s Word, nurture their faith, and serve as a living sign of His presence. 7:30 a.m. / 9:00 a.m. / 11:00 a.m. / 12:15 p.m. / 5:15 p.m.
7:00 a.m / 12:05 p.m. / 5:15 p.m.
12:05 p.m. / 5:15 p.m. / 7:00 p.m.
Fifteen minutes before Mass times. © 2019 ST. MARY MAGDALENE CHURCH OMAHA. ALL RIGHTS RESERVED.